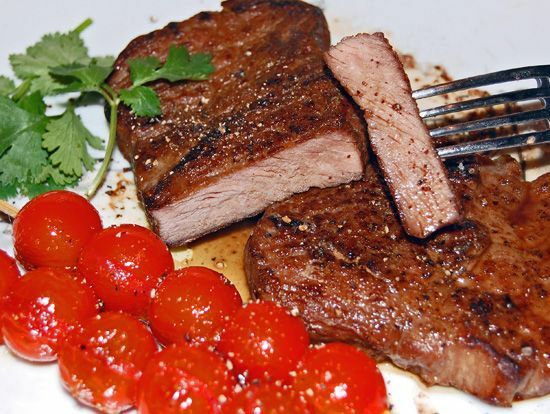 Steak slices – a dish that is wonderfully suited for dinner. The taste of the steak slices perfectly accentuate boiled potatoes, vegetables and pickles. As a drink a semi-sweet red wine. Before cooking you must cook the meat, preferably beef broth. Wash the meat when a piece of rough to wrap it up thread. Onions wash, peel and cut into quarters. Scrape the carrots and cut into small slices. Melted butter melt in a saucepan. Brown the meat on all sides. Add to sauteed meat onions and again fry with the meat. Then put the other ingredients: salt, carrot, grains of pepper, anchovies, grains of white pepper. Pour meat broth and a spoonful of vinegar. Cover the saucepan with a lid and cook over low heat for 1-1. 5 hours. If the broth evaporates add a little water. Cooked meat to shift to the dish. Wrap the top with foil to keep meat warm. Next you need to make the sauce for the steak. For that remaining from the cooking meat broth, strain and pour half liter. If needed, refill water. Bring strained broth to a boil. Flour dry and mix with a small amount of water and add to boiling broth, stirring constantly. Pour in the boiling cream and cook for about 5-7 minutes. To taste add salt and pepper, a little soy sauce. Remove meat from foil and slice thin (about 5 mm) slices, place on warmed serving dish. A little of the sauce to baste the meat slices, the rest pour into a gravy boat.